Description: LOCATION, LOCATION, LOCATION! It just doesn't get any nicer than Chapel Hill. 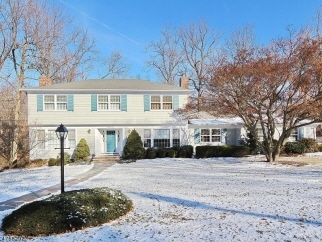 Beautifully situated near the top of the Mountainside hills, - this spacious Center Hall Colonial features, 5 bdrms, 3.5 baths, two fireplaces, eat-in kitchen, 1st floor laundry ,Trex deck, HV/AC unit/2yrs old, new h/w heater, Hunter Douglas shades, pull down attic for extra storage, prestigious entrance foyer w/double closets, sweeping curved staircase, pocket doors. Lower level has a large rec room, kitchenette, full bath and bedroom-GREAT lower level for separate living space. Long, flat driveway leads to a park-like, beautiful yard. Steps away from the Watchung Reservation, Trailside Science Center, Loop Park and Watchung Stables.